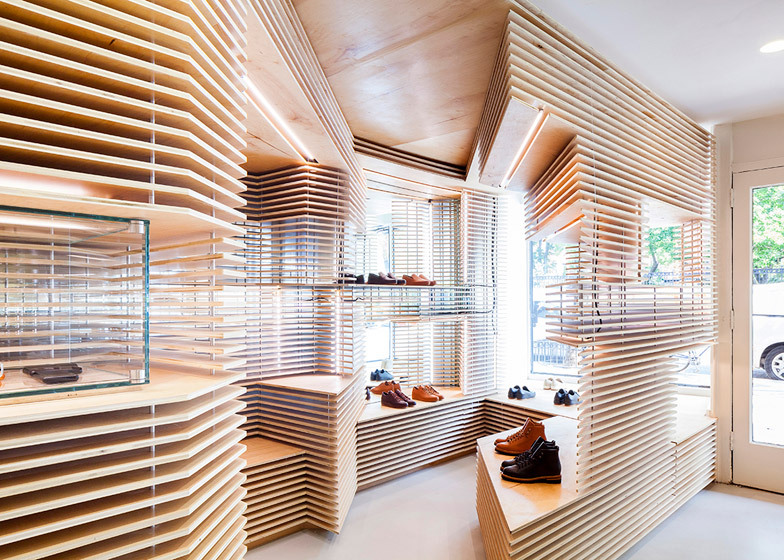 Australian artist Jordana Maisie, who lives in Brooklyn and creates architectural, light and sculptural installations, has decorated a boutique in Manhattan for the shoe brand Feit, whose interior is ‘folded’ from thin sheets of plywood. The laconic boots and shoes, made of calf and buffalo leather, Josh and Tull Prices have been manually sewing for 10 years. Tull Price is known for having invented the Royal Elastics sneakers and also he had been in charge of the Rag & Bone shoe line for several years, but in 2005 he and his brother engaged in footwear for aesthetes, which they produce in a very limited edition, each pair is signed and dated. 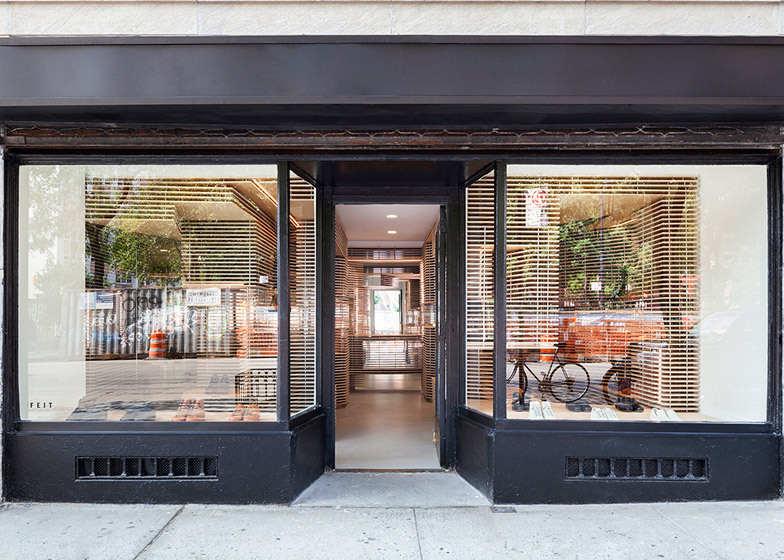 The first Feit flagship store in Manhattan opened a year ago, and Jordana Maisie has also made its conceptual interior – it was the first project of the Australian artist in New York. For the second store of the brand she came up with a design that reflects the main advantages of these shoes: perfect handmade quality and its minimalist aesthetic. 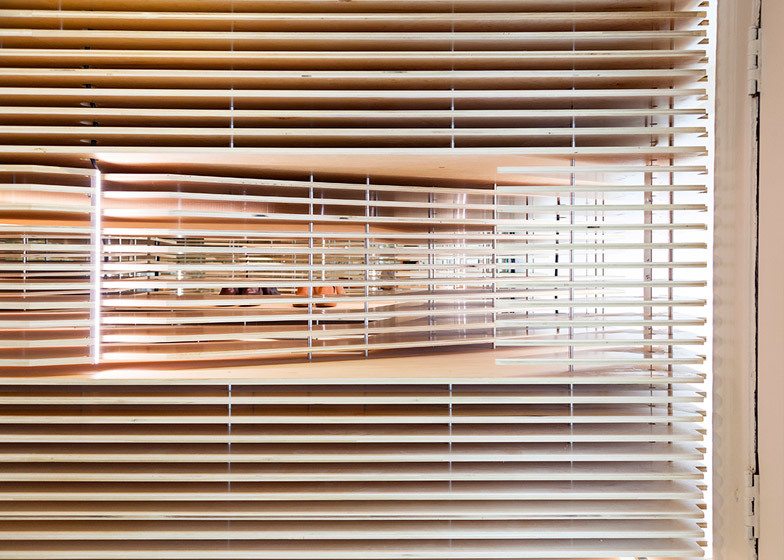 The entire interior space of 39 square meters in the West Village consists of a single multi-layered construction of asymmetric shape. 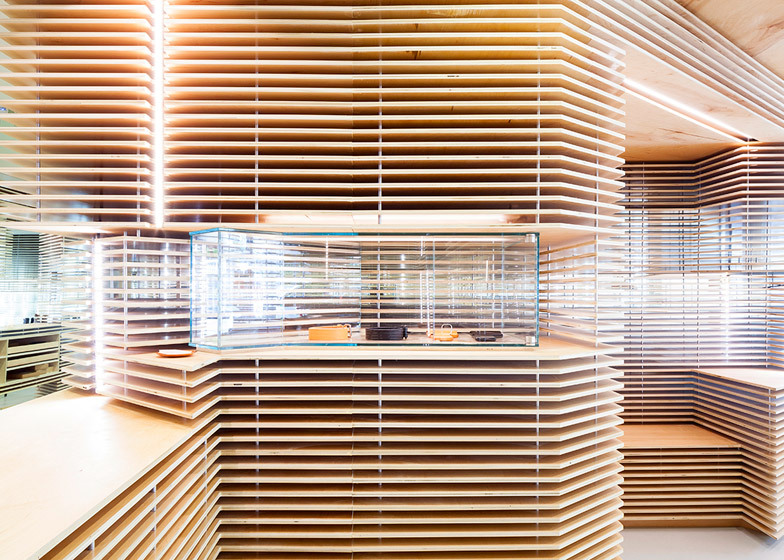 Thin sheets of light plywood of Baltic birch are strung on steel pillars, forming a complex maze of arches, shelves and inlays of mirrors and glass, which occupy the entire store – from the floor to its ceiling. The birth of the interior took place in the designer’s studio: the result of a long 3D-modeling she had been cutting out by piecemeal on a machine with computer numerical control and sending finished modules to the shop. 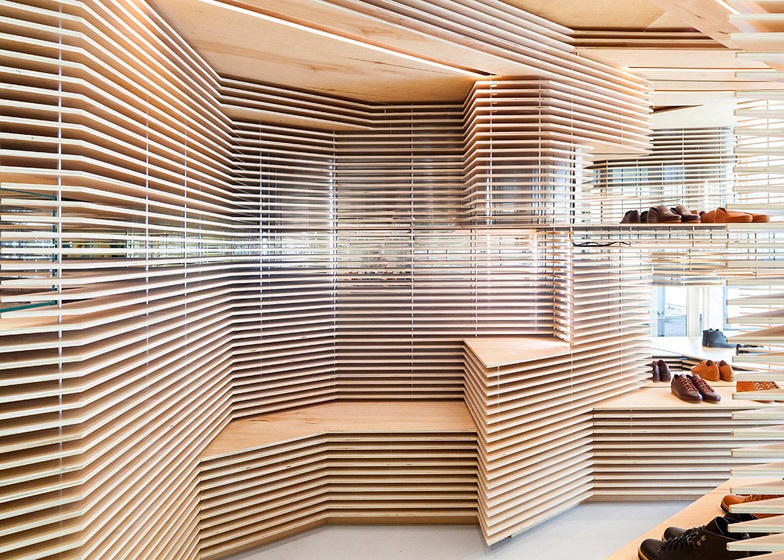 In the place of construction it was assembled in the same way as the master stitches custom shoes, the installation was carefully and meticulously fitted to the space of not a very simple configuration. “The interior has a unique identity – prioritising process, craft and innovation, while pushing the tension between what is handmade and what is machine made,” said Maisie. 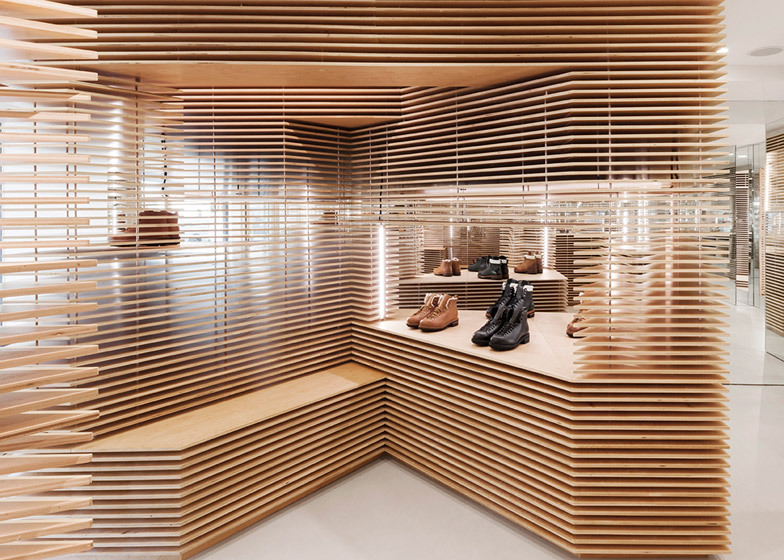 The shop “has a clean aesthetic featuring geometric shapes created by volume and void,” she added. “Each unique shape was CNC cut, hand sanded and assembled into modules offsite by the fabrication team, which enabled a complex build sequence to unroll on site,” said Maisie. The footwear, which all the participants treat as a work of art, has a special place in the shop – shoes, as museum displays, are exhibited in glass cases. Part of the shoes are still standing on the asymmetric shelves, so that customers have a chance to touch the master’s art.